Chiropractors, Osteopaths, Osteomyologists and Physiotherapists working together in managing back pain. Back pain is estimated to affect 80% of people at some stage of their lives. It is a burden on the health system, interferes with normal daily activity and costs society millions each year in days off work. Early chiropractic, osteopathy and physiotherapy intervention can help prevent the development of chronic back pain. Back pain is usually caused by a combination of muscle spasm and joint restrictions which lead to symptomatic pain. 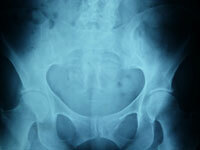 Back pain can feel awkward and often causes the pelvis to feel like it’s twisted. With back pain, there’s usually more stiffness felt in normal movements than normal, especially around the buttocks and lower back. Back pain can come on suddenly or build up over time. Back pain from poor posture, poor lifting techniques and other causes are common triggers for acute bouts of back pain. What muscles cause back pain? The gluteals, piriformis, psoas, quadratus lumborum and lumbar paraspinals are the most commonly affected muscles and they are the most likely to go into spasm. When muscles are strained they become stiff and shorten, pulling on the structures in the spine to which they are attached. What parts of the back are affected by back pain? 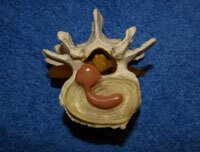 The lumbar vertebrae in the lower back spanning from L1 to L5 are most commonly affected joints in the lower back. If the muscles and joints remain abnormally restricted and tight over time it can lead to increased pain and further joint dysfunction. Joint restriction can potentially lead to accelerated disc injuries including tearing and osteoarthritis in the spine over the years. Can back pain cause disc tearing? The twisting of the spine due to muscle spasm can cause back pain and can lead to disc tearing if continued bouts are experienced without appropriate intervention. Chiropractors can provide appropriate intervention for back pain and are well placed to help with either a treatment or to help with referral. How can Back pain can be detected? 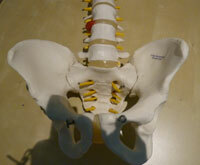 Back pain can be detected at a spinal check-up at Croydon sports Injury Clinic. A spinal check up with your chiropractor, physiotherapist or osteopath may help prevent damaging joint dysfunction and help maintain optimal spinal health. The chiropractic, physiotherapy and osteopathic professions provide treatments for facet joint restrictions which help to restore normal joint function and reduce back pain. Chiropractors and osteopaths use a low force high speed specific thrust administered through the area of joint restriction to help release the restricted joint –referred to as an adjustment. The cavitation sound or “pop” commonly associated with an adjustment is the release of gas as it escapes between the two articulating surfaces being adjusted. 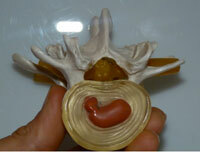 Chiropractors and osteopaths provide manual spinal adjustments in treatments for back pain. Chiropractors and Osteopaths are among the world’s leading manual spinal adjusters and are highly trained in the assessment, diagnosis and treatment of back pain and other musculoskeletal conditions. Back pain relief for musculoskeletal pain can be aided with effective chiropractic, physiotherapy or osteopathic intervention. Manual adjustments used by Chiropractors and osteopaths help to release joint restrictions, reduce muscle spasm and assist in the restoration of normal spinal joint function. What if I just get a massage, won’t that fix the back pain problem? Massage therapy and muscle relaxants if given by your GP may often help half of the problem by releasing tightness in the muscle tissue. Often muscles are only temporarily relieved but chiropractic or osteopathy manipulative treatment may be necessary to restore spinal mobility and remove the joint restrictions. How do I become a patient to have by back pain assessed? If you are someone that has experienced severe and debilitating back pain then making getting a check up with an osteopath, chiropractor or physiotherapist is recommended. At Croydon Sports Injury clinic we can help with managing musculoskeletal back pain caused by joint restrictions. We are here to help provide care for back pain with chiropractic, osteopathy physiotherapy and Osteomyology treatments at Croydon Sports Injury Clinic, Greater London.